The Wheat State District invites you to join them on Friday, December 7, 2018 for a special Winter Social at Intrust Bank Arena for the Wichita Thunder Hockey vs. Rapid City Rush matchup. Intrust Bank Arena is located at 500 E Waterman Street in Wichita, KS. You may access the Intrust Bank Arena website at http://www.intrustbankarena.com. 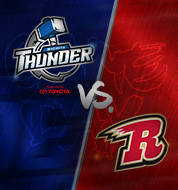 Wichita Thunder can be reached by phone at (316) 264-4625. Please join us for this exclusive opportunity to view this event from the Premium Party Suite #1 at Intrust Bank Arena, as well as networking with Milling Industry colleagues and spending time with friends/contacts in the comfort, privacy, and luxury of this Suite. The Allied Trades will sponsor a social hour which will begin at 6:05 p.m. in the Suite. There will be food for dinner and snacks to enjoy during this time as well. At 7:05 p.m. we can be seated in the seats of the Suite to watch the game or you can continue to mingle in the Suite and watch the matchup on the large screen TV’s. Please note advance registration is required for this event. We have purchased and are limited to 32 tickets due to Suite capacity (there is a 32-person limit in Party Suite #1). So please register and reserve early to ensure your spot! Once the tickets are gone, registration will be closed. Any cancellations received after December 1, 2018 will not be refunded. To register online with credit card, please click here: Online Registration (credit card payment). If you want to call and pay by credit card, you can call the IAOM office (913) 338-3377. For more information or to register by check, please click Downloadable Registration Form. If sending by mail, please be sure to send as soon as possible to ensure it is received before all tickets are sold. Check must be received to hold your ticket. Please note it is important to provide the address where you want the ticket(s) mailed. However, if you don’t get a ticket, lose it, or forget it, just let me know and we can reprint it at the box office the day of the event. We are excited to host this event and hope you are able to make arrangements to attend. If you have questions, please contact Tracy Eustace at (316) 283-7171 or email at tracye@wdpatterson.com. This Suite is located on Level 3. Party Suite #1 is on the East Side. Intrust Bank Arena has capacity per the fire code, so we must be sure we don’t exceed 32 people in the 32-person party suite #1 at any time. Fastest entry can be obtained via Entrance B (east doors) which is located at the Southeast corner of the arena where you then can take the elevators (SE area) to Level 3 where the Suites are located. This is the premium ticket entry. You may also access the arena via any of the other Entrances (depending on where you park), but must walk around interior perimeter to the southeast side and take the elevators (SE area), as these are the only elevators to Level 3 (for access to the Suite). For Directions and Parking information, please click here. There is city parking around the arena. If you need a hotel room, there are several in the area such as Courtyard Wichita at Old Town, Fairfield Inn & Suites Wichita Downtown, Hotel at Old Town to name a few. Please click here to view a larger listing and information for nearby hotels. We have not blocked any rooms at these hotels, and you will need to contact them directly to make reservations.